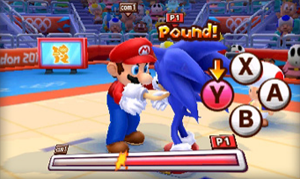 Mario, Sonic and friends compete in over 50 olympic events in this portable release. Use the touch screen, motion controls and microphone to clear events and win medals. There is also a Story Mode where you must stop Bowser and Dr. Eggman's foggy creations the day before the opening ceremony.